A digital billboard can improve the image of your business. A good billboard is the key that will ensure a good agreement with your customers. Combined with the Linutop operating system, it will no longer remain a simple screen, but it will be a powerful communication tool. What are the benefits of a good digital billboard? First of all, a good digital billboard is a modern and professional way to give a warm welcome to visitors who enter your building. It also becomes interresting when you use it as a communication tool to project various types of information ranging from simple texts to HD corporate videos. With good accessories ( see Linutop OS ), it can also stream movies, flash animations and web pages. This dynamic display can also be used to play audio files. A billboard will ensure quick and easy dissemination of information to your customers or employees. Your billboard screens with the help of mini-PC Linutop allow you to communicate faster. The system can operate 24/7 and is specially designed to be a low power system. Their configuration is very simple and these mini PC fanless operate quietly. Linutop mini PCs are the perfect accessories for digital billboards. Due to their small size, they can be installed wherever you want in shops, restaurants, hotels, museums or public transport, whatever. As a digital signage display medium, they have several features. It is possible, for example, to set the duration of each folder: photos, videos, Web pages ... With Linutop, a multitude of parameters are available. 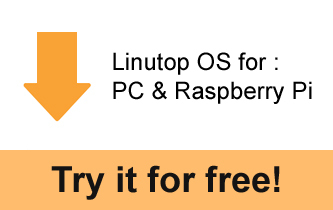 In addition, the Linutop Operating System is available for PCs and Raspberry Pi. It is available for free download here! If you already own a raspberry Pi, you can turn it into a powerful digital signage player by installing Linutop OS on it and plugging it on your display screen. Finally, if you already have NEC screens, the Linutop OS can now run on "NEC Large-Screen Pxx4 and Vxx4 Displays" with a Raspberry Pi Compute Module. Once you plugged your player to your screen you can also benefit of the Linutop TV service which enables to manage as many screens as you want with only a web portal. It is even available in two versions, one accessible via Internet and the Cloud, and the other one totally private, installed locally for maximum privacy.